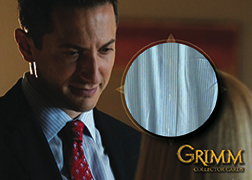 Grimm is one TV show that seems perfect for a set of trading cards. Even without the greatest ratings, its mix of drama and lore give it all the ready-made content for a modern set. And that's exactly what it's getting. 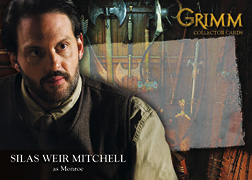 2013 Breygent Grimm trading cards offer a broad mix of base cards, inserts, autographs and other hits highlighting the show. 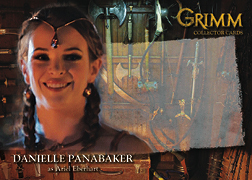 The 2013 Breygent Grimm base set comes with a fairly standard 72 cards. 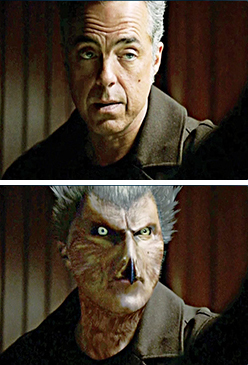 It recaps storylines and highlights some of the show's many characters. Breygent guarantees that a full base set is in every sealed box. The show is a mix of a modern cop show, kind of like C.S.I., mixed with an element of fantasy. The release's chase cards are led by autographs, costume cards and prop cards. While two total hits are promised in each box, many have three. A total of 15 people are signing for the set. Tentative signers include Sasha Roiz, Claire Coffee, Neil Hopkins, Titus Welliver, Silas Weir Mitchell and Danielle Panabaker. The set has 17 different prop cards that include pieces of items used in the show. Among them are several weapons that have been sliced into pieces appropriate for embedding into trading cards. The 21 costume cards include a mix of cards that have single swatches and others that have multiple pieces. Cards backs show the full piece of clothing that was cut up as well as a mention of the episode it was worn. 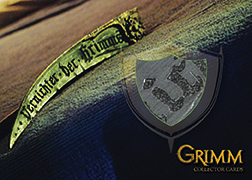 2013 Breygent Grimm also has a trio of basic insert sets. Lenticular Flip cards use the technology to show characters transform from their human form to a fantasy creature. The set has 15 cards with two inserted in every box. Other inserts include Aunt Marie's Trailer puzzle cards (nine cards, 1:12 packs) and Grimm Secrets (three cards, 1:24 packs). Dealers ordering three 12-box cases receive a sketch card. Those ordering 15 cases get a master set. Featuring 17 cast members. Click here for a detailed look at all the set's autographs. Each actor signed 2 different cards, execpt for Mary Elizabeth Mastrantonio, who only signed 1. Featuring 19 artists, with print runs noted. Sketch cards are the 3-case incentive and are randomly inserted into boxes.